The Park Tower Casino in London has already established itself as one of the most exclusive locations in the English capital. The Park Tower itself is a piece of prime real estate in the Knightsbridge area of London - right next to the world famous Hyde Park. Getting to and from this excellent casino is done easily via car, taxi or using the tube system and getting off at the Knightsbridge stop. As a selling point this casino advertises its closeness to some of the more fashionable shops in London, including Harrods and Harvey Nicholls. One thing you can be sure of when you come to this casino is that you will have a very memorable experience. It is not all about the gambling here - even though that is a huge part. Dining and drinking go hand in hand with what this casino is all about and the modern cuisine is really a treat. Inside it feels like a casino with an "It" factor - the carpets are purple and gold and the ceiling has a metal cover that just makes it feel elegant. Things only get better when the decor of the bar and the restaurant are seen but we will save those treats for further down in our review. One thing that does show just how special this game is to Grosvenor is that it has a dedicated website. Very few out of the massive Grosvenor portfolio have this honour and it just puts the Park Tower Casino right at the top. There is no shortage of games when you enter the gambling floor. 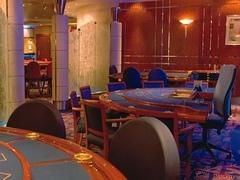 The more traditional table games include the likes of American Roulette, Blackjack and Punto Banco. If you are willing to mix things up a bit you can enjoy games of Super Stud Poker - a game where you play a five card Poker hand against the dealer - or a bit of Three Card Poker. If you like to bet and win big then you might want to ask for entrance to the Salon Privee. Now I'm assuming this is French and means Private Room but kindly correct me if I'm wrong. Anyways, the games available in this room are Punto Banco, American Roulette and Blackjack. Stakes start from £25 and can go all the way up to a whopping £10,000. For the more modern approach Park Tower Casino offers six electronic roulette machines where you can get away from the crowded tables. The main thing lacking is a good selection of slots but with their exclusive clientele and the gamblers that come they manage to get away with murder and not offer any. The exquisite balcony restaurant at Park Tower Casino is yet another reason to experience this venue. They even refer to it as "Fine Dining", something that we should not take lightly - and they sure don't. In terms of the menu they offer a mixture of modern European food and Arabic style dishes. The restaurant has its own wine list and prices range from your very basics to some of the top wines available. One thing about the Restaurant is the balcony location. You sit and look out over the gambling floor while you enjoy some of the finest dining in all of London. This makes it an even more unique experience and it is well worth visiting Park Tower for the food alone. But combining the food and the gambling makes for a top night, with a loved one, friend or just on your own. If you feel like the fine dining experience is not for you then the bar offers a range of lighter and less intricate meals. The theme of the food is still Modern European and Arabic but far from as fancy as the actual dining area. If you are just after a casual drink or two this is definitely the place to be. A wine list that is almost as good as the restaurant is joined by a wide range of spirits, cocktails, beers and non-alcoholic drinks. Park Tower Casino really offers everything in terms of food and drinks at this top London venue. Entertainment might not be as good as you can hope but they do offer an excellent sports bar whenever major sporting events or games are on. This is a nice breakaway from all the fancy, upper class, activities that happen otherwise. We have hailed this casino as the place to go in London - for good reason. But there is never such a thing as perfection in the world of casinos. One thing that they really lack is tournaments. Well, if you go and look for tournaments on their website or on the Grosvenor information page you will come up empty. The same goes for events and promotions. However, if you get your hands on a membership card - which is far from impossible - then you might be privileged to information that we do not have. Why the Park Tower Casino? It has a prime London location with views of some of the most famous sights in the entire city. Alongside this we find some excellent dining options with a modern cuisine that holds its own as a restaurant, even without the casino operation. To shorten everything up: this is an exclusive place for anyone that wants to feel a bit more special. For some people it might be a bad thing but if you love the genuine casino experience, riches and glamour then there are few better places in Europe to go for it.